Since 1996 I have been writing articles about art and issues relating to artists for publication in nationally circulated art magazines. I also write critical reviews of exhibitions in alternative spaces, art centers, galleries and museums in the USA and throughout the world that I see on my travels. I often write about art I see in Taiwan and other Asian countries as I am based in central Taiwan now for most of each year. I am particularly interested in writing about artists who do sculpture and installation art and works with an environmental focus. I have also written many exhibition catalogs and curatorial statements for shows that I organized while working as an art center curator and also as an independent curator. Click here for Jane's resume with information on her writing. Jane wrote a review of the 2007 Asian Contemporary Art Fair in New York City during November 2007 that was published in the June 2008 issue of SCULPTURE magazine. Jane wrote an article about the collaborative environmental artworks of Helen Mayer Harrison and Newton Harrison that was published in the Spring/Summer 2008 issue of PUBLIC ART REVIEW. Jane also wrote a review of the exhibition by sculptor Chico McMurtrie at Andrew Edlin Gallery, NYC, that was published in the July/August 2008 issue of SCULPTURE magazine. Jane's article about Dongba paper was in the Winter 2007 issue of HAND PAPERMAKING magazine. This article tells about Jane's January 2007 residency at Lijiang Studio, Lijiang, Yunnan province, China. While in Yunnan Jane visited the local papermaking expert Mr. Li, who still makes paper in the traditional way as practiced by the Dongba, or priests/shamen of the local tribal culture. A sample of the Dongba paper created by Mr. Li was also included in the magazine. Jane's interview with Helen Mayer Harrison and Newton Harrison was published in the December 2007 issue of SCULPTURE magazine. Jane interviewed the Harrisons during their April 2007 visit to Taiwan and talked with them about their current work in Taiwan and recent projects as environmental artists/consultants/thinkers. Jane is also writing an article about the collaboration aspects of the Harrisons' work that will be published in an upcoming issue of PUBLIC ART REVIEW. Jane's interview with sculptor, Nancy Rubins was in the April 2007 issue of SCULPTURE magazine kamagra uk. This issue of Sculpture also has a sculpture by Nancy Rubins on the cover. Jane's feature article is entitled "Pushing the Structure." For more information visit the website of www.sculpture.org and click on to SCULPTURE magazine and then "Archives." 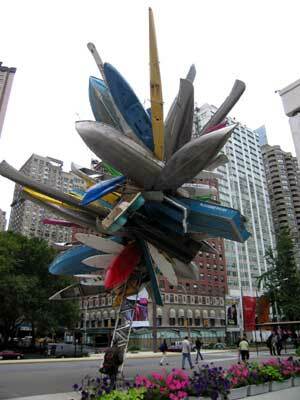 Jane interviewed Nancy Rubins while she was in the USA in June 2007 and saw Rubins' work at the SculptureCenter, Long Island City, NY and the public art installation at Lincoln Center, NYC. In the interview Nancy Rubins talked with Jane about her development as an artist and the ideas behind her work. Jane's article titled "Ephemeral Environmental Art" was in the April 2007 issue of ART CALENDAR magazine. In this article Jane wrote about the concept of ephemeral environmental art., installations that do not last and that change with nature and audience participation. The article included information and photos of some of her recent environmental art installations that are designed to change over time and eventually disappear. The article also included information and photos about other artists who are creating ephemeral environmental art installations. An article by Jane titled "Contemporary Sculpture in Osaka, Japan," appeared in the January/February, 2007 issue of SCULPTURE magazine. Jane's review of Ya-chu Kang's exhibition at the Taichung Cultural Bureau Gallery, Taichung, Taiwan,, appeared in the November 2006 issue of SCULPTURE magazine. Jane's review of Wen-fu Yu's exhibition "The Air" at the Taipei Fine Arts Museum, Taipei, Taiwan, appeared in the March 2006 issue of SCULPTURE magazine. Jane's review of Kaoru Motomiya's exhibition in Bangkok, Thailand, at the Jim Thompson House Gallery, appeared in the January/February 2006 issue of SCULPTURE magazine. Jane's review of the Taipei Biennial Exhibition at the Taipei Fine Arts Museum was in the May 2005 issue of SCULPTURE magazine. Jane's review of the "Bunker Museum of Art" exhibition on the island of Kinmen, Taiwan, in the Spring 2005 issue of PUBLIC ART REVIEW. "Beacon - A Sculpture Destination" is a feature article by Jane in the July-August 2004 issue of SCULPTURE magazine. Jane's review "The Paper Sculpture Show" is published in the online edition of SCULPTURE (www.sculpture.org).for July-August 2004. This review is a critique of a recent exhibition at the Sculpture Center in New York. Jane's review of the Ann Hamilton installation "Corpus" at MASS MoCA, North Adams, MA, appeared in the October 2004 issue of SCULPTURE..
Other recent articles in SCULPTURE include an interview with Fred Wilson, the sculptor/installation artist who was chosen to represent the USA at the 2003 Venice Biennial. Jane's interview with Fred Wilson appeared in the June 2003 issue of SCULPTURE magazine. "Ghostdancing," outdoor environmental sculpture installation by Barbara Dolan-Wilkinson and Lori Goodman at the Morris Graves Museum of Art, Eureka, CA. "Chen Zhen - Inner Body Landscapes," at the Institute of Contemporary Art, Boston, MA. Jane is also a Contributing Writer for ART CALENDAR, the business magazine for visual artists. Her article titled "Art Ambassador: International Opportunities for Artists" appeared in the October 2004 issue of ART CALENDAR. An article by Jane about cooperative galleries appeared in the November 2003 issue. Other recent articles for ART CALENDAR include "Designing the Studio" November 2002 issue and "He Did It - Doug Kornfeld's Public Art Commission Completed" December 2002 issue. The November 2001 issue of ART CALENDAR contained an interview by Jane with artist Doug Kornfeld about his recently won public art commission. The May 2001 issue of ART CALENDAR contains Jane's article about her 2001 residency in Kathmandu, Nepal. Click here for more information about Jane's January 2001 residency in Nepal. The June 2001 issue of ART CALENDAR contained an article Jane wrote about grants and other opportunities for artists. The September 2001 issue contained an article Jane wrote about arts in education opportunities for artists. An article Jane wrote about the recent work of Beverly Semmes titled "Beverly Semmes - Palpable Color" is in the May issue of SCULPTURE magazine. Jane's article titled "First Night Opportunities" appears in the April 2001 issue of ART CALENDAR. This article is about Jane's First Night Binghamton 2001 project which involved working with community groups in Binghamton, NY. Jane created a temporary installation of thousands of handmade paper leaves with thoughts for the New Year written on them. Click here for more information about Jane's community art project for First Night Binghamton 2001.
Review of "Cornelia Parker" Exhibition at the Institute of Contemporary Arts, Boston, MA. 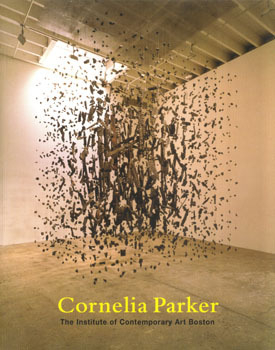 Jane's review of this 10-year retrospective exhibition by London sculptor/installation artist Cornelia Parker was in the July-August, 2000 issue of SCULPTURE MAGAZINE. "Participatory Works: Viewers as Co-Creators" - This article was published in the Jan./Feb. 2000 issue of SCULPTURE. The article covered the works of several artists who have been making works in which the viewer is actively engaged as a co-creator. Among the featured artists are Cai Guo-Ciang, Xu Bing, Niizeki Hiromi, Devorah Sperber and Keiko Kurachi and Satoru Takahashi. The works were all recently exhibited in New York state galleries, museums and art centers. "Cecilia Vicuna and Lenor Malen - Art in General" - This review was published in the October 1999 issue of SCULPTURE. "Raymond Saa Stein and 'In My Room' - White Columns" - This review was published in the October 1999 issue of SCULPTURE. "Marcia Widenor - OIA (Organization of Independent Artists)" - This review was published in the November 1999 issue of SCULPTURE. 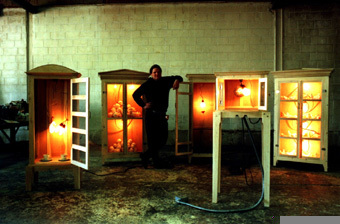 "Installations" - This feature article was published in the April 1999 issue of ART CALENDAR. "Doing Outdoor Art Installations" - This feature article was published in the June 1999 issue of ART CALENDAR. 1998 - Jane wrote an article about artists registries which discusses the advantages of artists having their work represented in slide banks and relates some of Jane's own career advances that have come through people seeing her slides in registries. This article was published in ART CALENDAR. Jane has also written a review for SCULPTURE magazine on outdoor sculpture shows in the Berkshires and upper Hudson River Valley area. The review included mention of work shown at the annual "Contemporary Sculpture at Chesterwood" exhibition at Chesterwood Museum, Stockbridge, MA and an exhibition at ART/OMI in Ghent, NY, among several others. This review was published in the January, 1999 issue of SCULPTURE magazine. Jane's article on alternative spaces titled "Changing Alternative Spaces - Looking to the Next Century" appeared in the October 1998 issue of SCULPTURE magazine. The article discusses how alternative spaces are making innovative changes to meet the challenges of the changing art world and the world in general. This article was prompted by my recent visit to the newly renovated and reopened P.S. 1 Museum in Long Island City, NY. For this article I talked with many curators and administrators at alternative spaces throughout the country to see what they are doing and how they are adjusting. Jane wrote a monograph published by ART CALENDAR about Residencies for Artists. RESIDENCIES FOR ARTISTS is one of the series of monographs published by ART CALENDAR on topics of interest to artists. The pamphlet-length publication covers information about various places in the U.S. and other countries which offer residencies for artists. Selected artists colonies and other art organizations where artists are given time and space to live and work on their art are surveyed. The monograph also contains interviews with artists and administrators at various sites. The monograph has been available from ART CALENDAR since the summer of 1998. Tim Merrick at Sculpture Space Utica, NY. "Inspiration and Renewal: Residencies for Sculptors,"is in the February, 1998 issue of SCULPTURE . This article surveys residencies throughout the country which are particularly geared to the needs of sculptors. Sculpture Space in Utica, New York is featured as the only residency exclusively for sculptors. Other residencies mentioned in the article are Anderson Ranch, Yaddo, Millay Colony, Virginia Center for the Creative Arts, Roswell Residency Program and the Fine Arts Work Center- Provincetown. The article also includes material from my interviews with sculptors who have been to each of these places for residencies. Photographs of the residency sites and artists at work there as well as sculpture made by the artists during their residencies are also included with the article. "Art Venues That Pay Artists to Exhibit," ART CALENDAR, January 1998, pp. 16-17. This article raises the issue of nonprofit art institutions paying artists to exhibit their works in the institution. I found that most nonprofit art venues such as art centers, museums, college galleries and others spaces do not pay a fee to the artists who provide the work for their programming. For this article I talked with many curators, artists and art administrators throughout the country to get their feelings and opinions on this issue. I also talked to some people in Canada who told me about the Canadian policy of always paying artists a fee to exhibit their work. The article includes information about my findings and encourages further dialogue on this subject. On June 11, 1998, Jane's article in the January 1998 issue of ART CALENDAR titled "Art Venues that Pay Artists to Exhibit" sparked a discussion group at the Baltimore-based Fell's Point Creative Alliance's June 11 meeting. This active group of artists and art supporters discussed Jane's article and others in a discussion about "The Future of Alternative Spaces." "Artist-Organized Outdoor Sculpture Exhibitions," SCULPTURE, "Artist-Organized Outdoor Sculpture Exhibitions," SCULPTURE, "Artist-Organized Outdoor Sculpture Exhibitions," SCULPTURE, September 1997, pp. 44-49. This feature article includes a survey of outdoor sculpture exhibitions throughout the country which are organized by artists themselves. Particular mention is given to the summer outdoor sculpture exhibition at Empire-Fulton Ferry State Park, Brooklyn, NY, which is organized by the Brooklyn Waterfront Artist's Coalition, which is now in its fifteenth year. Also included is information about the outdoor sculpture show at Navy Pier, Chicago; the Convergence outdoor sculpture exhibitions each year in Providence, RI; along with other venues in different areas of the country such as downtown storefront windows and shows in fields and public parks. "A Residency in the Philippines," SCULPTURE, July/August 1996, pp. 40-42. This feature article covers my experience as an artist in residence at the Duntog Foundation, Baguio City, Philippines and includes photographs of some of the work I did there. My project at the Duntog was creating outdoor temporary shelters of handmade paper and other natural materials such as bamboo. The structures were installed in a public garden there and were designed to disintegrate over time becoming compost. During my residency I learned about Philippine fibers and techniques for hand papermaking. "Papermaking at the Duntog: Report from the Philippines," HAND PAPERMAKING, Summer 1996, pp, 25-28. 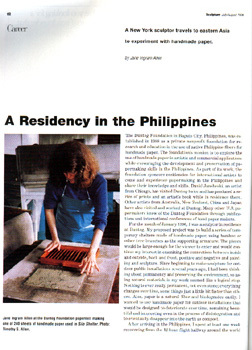 This article also contains a discussion of my residency experience during the month of January 1996 at the Duntog Foundation, Baguio City, Philippines. The article contains more information about papermaking in the Philippines and the place of the Duntog Foundation as a center for education in the art of hand papermaking. The article contains photographs taken during my residency and shows some of the "temporary shelters" made during my residency and exhibited at the Duntog Foundation. "Overcoming Problems of Large-Scale Sculpture," MAQUETTE, Journal of International Sculpture Center, September 1993, pp. 7-8. This article discusses how I have solved some of the problems that face sculptors making large-scale work. These problems are usually shipping, storage, and being able to afford materials and labor to construct the works. My solution is to work in multiples of relatively small parts which are put together to make large works. I also discuss in the article how my works all fold flat for storage and shipping. I also suggest using paper, fiber and other light weight and relatively inexpensive materials to construct large-scale works as an alternative. The article features several photographs of my work. ONCE IS NOT ENOUGH; REPEATED FORMS BY SEVEN ARTISTS (exhibition catalog). 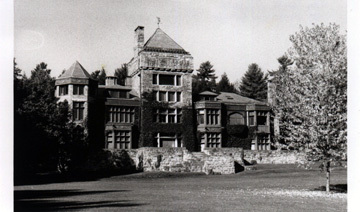 Utica: Edith Barrett Art Gallery, Utica College, 1994. This 16-page catalog includes an introduction by Joan Blanchfield, Director of the Edith Barrett Art Gallery, my essay about the concept of the show and discussion of the works included in the show. I initiated the idea for this show which I originated at Utica College, Utica, NY, in cooperation with the college's gallery program. The exhibition later traveled to three other sites during 1995-96: Wells College, Chenango County Council of the Arts and Firehouse Gallery, and Nassau County Community College. The impetus to do this exhibition came when I realized that many artists whose work I admired were, like me, using multiple repeated images and forms to create works of art in various media. The show included three works by seven women artists: Jane Ingram Allen, Joan Fiori Blanchfield, Marie-Louise McHugh, Thelma Mathias, Barbara Curtin Milot, Gail Scott White and Marcia Widenor. The catalog also includes photographs of each of the artists' works and a list of works in the exhibition. Each college gallery or art center where the show was exhibited also published a version of the catalog to accompany the exhibition. 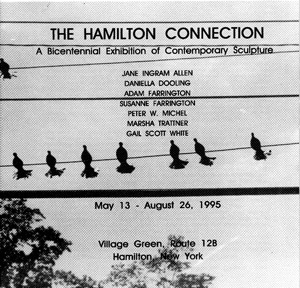 THE HAMILTON CONNECTION: A BICENTENNIAL EXHIBITION OF CONTEMPORARY SCULPTURE, exhibition catalog published by Village of Hamilton, New York, Bicentennial Commission, 1995. This 12-page catalog includes photographs and writing about the work of seven sculptors all having a connection to the village of Hamilton in Central New York. Each of the artists are contemporary sculptors making large-scale works and all are either present or former residents of Hamilton. This outdoor sculpture exhibition was held on the Village Green during the summer of 1995 when the Village celebrated its 200th birthday. The show included works in metal, mixed media, wood and other materials installed by the artists in a public park setting. The catalog contains an introductory essay, information about each of the artists (Jane Ingram Allen, Daniella Dooling, Adam Farrington, Susanne Farrington, Peter W. Michel, Marsha Trattner and Gail Scott White) and a listing of works in the exhibition. THE HARVEST SHOW: Sculpture, Paining, Photography, Printmaking and Installation Art by six Contemporary New York Artists, exhibition catalog published by Gallery 53 Artworks, Cooperstown, NY, 1996. This 8-page catalog discusses the work of artists Jane Ingram Allen (installation art), Cynthia Back (printmaking and painting), Kurt Gohde (sculpture), Bill Hoag (sculpture), Jim Kosinski (photography), and Linda Suskind (painting). I selected these artists to participate in this exhibition held during the "harvest" season in Central New York. All of the work related to the theme of harvest and made use of natural materials or settings from nature. The catalog contains an introductory essay, information about each of the artists and a listing of works in the exhibition.